Dudu Omagbemi scored a brace for the visitors to earn what could prove to be a vital point. 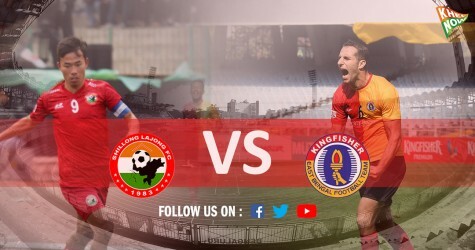 Shillong Lajong FC, as always, proved to be a juggernaut for Kingfisher East Bengal who played out a 2-2 draw at the Jawaharlal Nehru Stadium in Shillong to leave the Kolkata outfit’s title-hope in jeopardy. Dudu Omegbemi (20′, 87′) continued to showcase his imperious goal-scoring form but he could salvage only a point from the jaws of defeat after Aiban (49′) and Samuel (69′) struck twice in the second-half. Earlier, the first half started off with both teams adopting an energetic and a fast-paced style of play. It could be clearly seen that Kingfisher East Bengal were more cautious in their approach as they dominated possession in the first ten minutes of play. Shillong Lajong, on the other hand, were clearly getting frustrated and were trying not to waste any time as they attempted to get into the groove quickly. Just as Lajong were starting to hold their own against East Bengal, they received a big blow in the form of a 20th-minute goal by East Bengal’s Macpherlin Dudu Omagbemi who pulled off an amazing header past the Lajong goalkeeper via an assist from Lalramchullova. With renewed confidence gained from the goal, the visitors started putting the pressure on the hosts with more intent which ironically made the hosts more cautious and composed at the back. Lajong’s best chance to score the equalizer came in the 36th minute when Samuel Lalmuanpuia managed to get past East Bengal’s defence only to see his swivelling shot from outside the box kissing the top of the woodwork. The second half started with an early goal attempt by Lajong’s Koffi in the 46th minute. Though Koffi was in a good position to score an equalizer, the ball went wide from its intended target. However, Lajong’s equalizer came in the 49th minute when Aibanbha Kupar Dohling headed a curling free kick by Samuel Lalmuanpuia home to silence the noisy travelling fans. 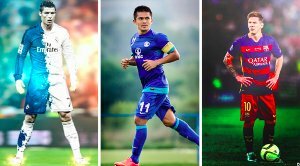 Two minutes after introducing Jobby Justin, the visitors suffered another mighty blow when the referee awarded a spot-kick as Mehtab Singh brought down Samuel inside the box. The youngster calmly hurled the second blow on the Red & Golds from the spot-kick in the 69th minute. 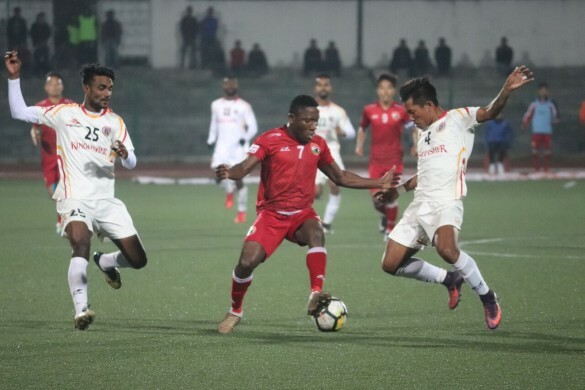 As the game passed the 80th-minute mark, it looked as though Shillong Lajong were going to pull off an inevitable win to stay out Red & Gold’s title hope but their Nigerian striker Dudu had something else in his mind. Dudu Omagbemi turned the tables on the hosts in the 87th minute with an incredible header after intercepting Kromah’s cross much to the delight of the visiting team who finally, could breathe a sigh of relief. Lajong had a golden opportunity to score during stoppage time but Koffi delivered a pathetic shot which went right past the goal. With the title race left wide open until the final day of the league, March 8, Kingfisher East Bengal will now get back to their den to host second-placed NEROCA FC. 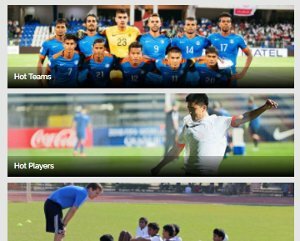 Meanwhile, Minerva Punjab FC will lock their horns with Churchill Brothers FC Goa and Gokulam Kerala FC will host Mohun Bagan at the same time to pull off a picture-perfect wrap up of the 11th edition of Hero I-League.